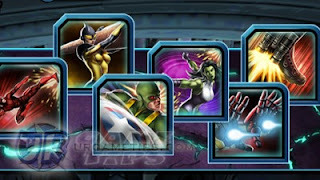 Marvel: Avengers Alliance 2 (MAA 2) is a RPG mobile game presented by Marvel Games, an all-new sequel to the smash hit Marvel: Avengers Alliance, with a robust mobile gaming experience, greater customization, and amazing high quality visuals. There is no link between M:AA 1 and M:AA 2. Logging in to Facebook in M:AA 2 allows them to save your game if you play on multiple devices/platforms or get a new device and wish to continue your existing linked game. - Required to launch missions. Energy is regained over time (6 minutes per 1 Energy); however, the maximum amount you can carry is 1000. Max Energy increases and is fully refilled after reaching the next Commander Lvl. - Used to unlock Hero and Ability upgrades, or acquire some types of Power Cells. 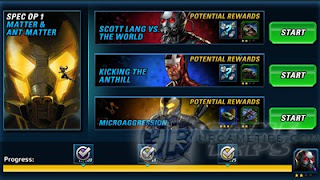 - Gained from combat rewards, Ally Team-Up bonuses, Daily Login Bonuses, Tournament rewards, and more. Chance to obtain from after battle roulettes, Store Options (Renewable or Quick-Charge Power Cell), and more. - The maximum amount you can carry is 250,000. - Used to purchase in-game premium items. - Gained from Facebook Connect, Daily Login Bonus, Daily or Story Tasks Completion Reward, Commander Level Up reward, and more. - Chance to obtain from various after battle roulettes including PVP Daily rewards, Store Options (Renewable or Quick-Charge Power Cell), and more. - Optional: Can be purchased with real money. - Required to launch PVP (Player vs Player) matches. Challenge Points are regained over time; however, the maximum amount you can carry is 360. - When a Hero reaches level 9, they are unable to progress further until you gather enough Research Materials the Hero requires. 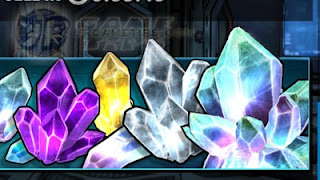 You will gain many of these materials through normal gameplay in various Missions in the game (tap and hold research materials under Heroes Tab to learn where to get them). - Materials you need can be farmed through "Scouting Missions", and have no maximum amount limits. - Required to launch Scouting missions. Survey Markers are regained over time, as rewards for various Tasks (Daily and Spec Ops Tasks), random item from the daily PVP rewards roulette, and can be bought with Gold. Heroes: How to Get More? - Having a large number of Heroes in your Collection ensures that you can construct a Strike Team that can make the best use of Class Advantage versus your opponents. - For starters, Hawkeye + 2 Random Heroes will be given as free heroes early game. - More Heroes can be acquired from the Store by using Gold and Superior Power Cells, which can be gained through normal gameplay. - Note though that you can also acquire a random Hero Ability instead of a new Hero. How to Obtain Specific Heroes? - Specific, exclusive Heroes may also be gained in PvP Tournaments, Special Operations (SpecOps), Chapter Mastery, and other special events in the game. - Example: The 7 Days Login Reward will give you a free Avenger Hero. - Keep an eye on the News Feed for information of new opportunities! - Legendary Power Cell: Given when a player didn't login for more than 7 days (did not test personally though, but a lot of players claim it). - Hero Levels increase with Experience (XP) gained from combat and by consuming Unstable ISO-8 gained from combat rewards as well as from the in-game Store. Unstable Iso-8: How To Get More? - Used to empower your Heroes to higher levels. In other words, consuming Unstable Iso-8 provides experience (XP) to a Hero. - To convert an Unstable Iso-8 to XP, go to the Hero > Choose Hero > Empower. - Unstable Iso-8 comes in several tiers, where the higher the tier, the more Silver is required and the more XP is gained on consumption. Found In: Combat, bosses, or from Supply and Rare Cells. Can also be obtain from after battle roulettes, Store Options (Renewable or Quick-Charge Power Cell), and more. - Used as a "Free Draw" from the Store to get Unstable Iso-8 for your Heroes. - Found In: Combat, bosses, and quest completion rewards. - If you don't have any Unstable Power Cells to get free draws, you can also buy them with Silver from the Store. Tip: Do not overdo it though, especially early game, save some Silver for your Hero and ability upgrades later on. - Every Hero has 8 different abilities, you can use 2 of these till Commander Lvl 10, and after that you can unlock 1 more. Heroes can also have 1 Tactical skill (unlocked by default, aka Recharge Skill) and 1 Passive Innate skill that can be unlocked at Hero Lvl 20. - Abilities can be equipped and swapped out in the Hero's customizable Ability slots. - To give your Strike Team the edge in combat is what Abilities your Heroes are equipped with and what your Team composition is. Creating synergies between Abilities and Heroes on your Strike Team increases their overall effectiveness as a combat unit. - Provides common 1-Star Abilities, which gives your low-level Heroes several options for their actions in Combat. Later in the game, Experimental Power Cells provide much of the Ability Points (AP) income you’ll need for Ability and Hero progression, as well as to purchase Abilities directly. - Found In: Combat, bosses, and quest completion. - If you have enough Ability Points, you can also buy them directly by checking the Hero's ability info. Note: Since you'll get lots of Experimental Power Cells as you go, it might be better to only purchase 2-Stars and above Abilities. - You receive Ability Points only when you get a duplicate result from the Store. - Found In: Various after battle roulettes including PVP Daily Rewards, Store Options (Renewable or Quick-Charge Power Cell), and more. 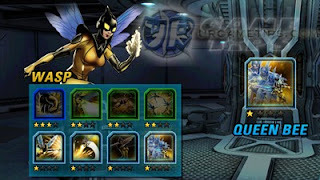 - Specialized abilities that can be acquired with Gold and various Power Cells, which can be gained through normal gameplay. - Provides Heroes an uncommon and rare Abilities, which are much more effective in combat compared to common Abilities. Duplicate Ability results from a Superior Power Cell or Gold provide many more Ability Points than they do from Experimental Power Cells. - Note though that you can also acquire a random Hero instead of a new or existing Ability. - Can be acquired from PvP Tournaments, Chapter Missions Potential Rewards (roulette) and more. - Can be unlocked once your Hero reaches Lvl 10. - Gaining more Stars on your Heroes and Abilities will also make you more effective in combat. Each Hero Star provides a big boost to their stats and each Ability Star makes the Ability more effective in combat. - Hero Stars are only loosely tied to Hero Levels, in that the ability to increase from one Star Rating to another is unlocked at Hero Level 10, 20, and 30. You can get a 1-Star Hero to Level 30, but you need to get your Hero to Level 10 before going for their second Star, Level 20 for their third Star, and Level 30 for their fourth Star. - Hero Stars require the completion of Hero Trials, unlocked at Hero Level 10, 20, and 30. - Note: Under the Trials tab, tap on your Hero's portrait to open the Hero Trials List. - Once Hero Trials are unlocked, you may initiate them by first paying their initiation cost (Ability Points, Silver, or Research Materials), then completing the listed tasks at the Hero Trials list. Once you have completed all tasks, return to the Trials page and tap the Collect button to advance the Hero’s Star rating. - Ability Stars work much the same way as Hero Stars, and are also found on the Trials page. Epic Heroes with 3 Stars! - Some Heroes are born epic - including The Hulk, Thor, Iron Man, Black Widow, and Captain America. These epic Heroes are exceptional, they start off as Level one and have three stars, with all the stat bonuses that come with the higher Star Rating. - The only way to gain these epic Heroes are from the in-game Store and from the special seven-day login reward. - Every Hero belongs to one of 5 unique classes, each with its own behaviors, strengths, and weaknesses. Each class is strong against one class and weak against another. - Team-oriented heroes who often have access to buffs, heals, and stuns. - Strong against Blasters, but weak against Infiltrators. - Fragile ranged attackers who focus on burst damage and area attacks. - Strong against Bruisers, but weak against Tacticians. - Tough heroes with high survivability that frequently protect their teammates. - They are strong against Scrappers, but weak against Blasters. - Melee attackers that have high sustained damage but often limited to single target attacks. - Strong against Infiltrators, but weak against Bruisers. - Elusive utility heroes that often use stealth and debuffs to set up for huge spike damage. - Strong against Tacticians, but weak against Scrappers. - Class used by enemy characters. - Generalists have no vulnerability or resistance to other classes. - In M:AA 2 attacks against a Resistant Class deal less damage, while attacks against a Vulnerable Class increases damage dealt and grants the hero the Class Advantage status – Increasing Attack, Defense, Accuracy, and Evasion by 15%. This gives the player a small advantage over the vulnerable class and a winnable situation against the resistant class, allowing you to take any and all heroes into a fight and still feel comfortable. - Each Hero has six core stats, each having an impact on how the Hero performs in combat. Hero stats increase with each level gained, and are affected by any Iso-8 Crystals slotted by the Hero. - Some heroes have higher potential stats than others. For example, the Hulk has higher Health than other heroes at the same level and Hawkeye has a high Accuracy stat. - Determines the maximum health the hero has; successful attacks on a hero reduces their health; when a hero’s health reaches 0, they are removed from combat. - Used to determine how much damage the hero does in combat; heroes with high Attack deal more damage with the same action. - A hero’s Defense impact how much damage they take from attacks; heroes with high Defense take less damage from the same action. - Determines how likely the hero is to hit or crit with their attack; heroes with high Accuracy are more likely to hit their target, and are more likely to deliver a critical hit (or even land a Devastating hit!). - A hero’s Evasion determines how likely they are to dodge attacks and how likely they are to receive crits; heroes with high Evasion are less likely to be hit or crit by an opponent. - Determines how often a hero can perform actions; heroes with high Speed perform actions more frequently than those with a lower Speed. - Every chapter has a collection of Tasks you can complete in any order for great rewards. Complete them all to recruit a powerful playable Villain for your strike team. - Unlocks after reaching Commander Level 4. - Daily Tasks award great prizes every day. Complete them all to win Gold! After you have completed a task, make sure to return to the Tasks window and tap Claim to collect. - Unlocks after reaching Commander Level 12. - Spec Ops are a series of time-limited missions. Complete all of the Spec Op Tasks to recruit an exclusive Hero. After completing a task, redeem right away to open up the new Spec Ops mission task. - No Hero EXP can be gained here, but you can get a handful of items from Deploy Missions. - Deploy a Hero if you have the required hero/es, complete the number of matches needed, then redeem your reward. - You can assemble your most powerful Heroes into an epic Strike Team to battle up the ranks and earn Special Tournament Rewards! - Starting from Rank 25, each battle won earns a Victory Point and increases your Strike Team's rank. Start a win streak of three matches in a row and you will earn double the Victory Points for each subsequent victory! - As you rise in the ranks, you will acquire Badges and earn their respective Rewards. Losses; however, will cause you to drop Victory Points and decrease your rank. If you fall in the ranks, you will lose any previously acquired Badges and Rewards. Rewards accumulate across Badges and are awarded at the end of the tournament. - Win three active Tournament matches in a day for prizes! - The player does not lose or gain PVP rank unless they initiated the PVP Fight (no defensive battles). Rank is based on consecutive victories, and Win Streaks will boost you through the ranks even faster. - Practice Mode: To hone your battle skills and perfect your Strike team. - Special Tournament Power Cells are awarded in PVP that can be opened to receive exclusive PVP Heroes and Iso-8. 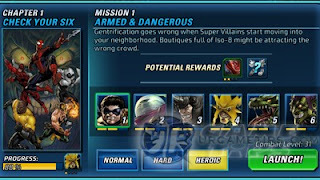 - You can save your Marvel: Avengers Alliance 2 game progress and sync across your devices using Facebook. 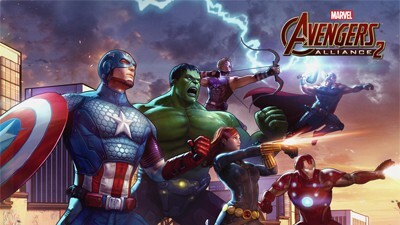 - Upon launching Marvel: Avengers Alliance 2 for the first time, you will be offered the option to connect to a network. Tap the Facebook button and log into Facebook to connect your game progress. - If you had started playing without connecting to Facebook, you can still connect and save your game progress.